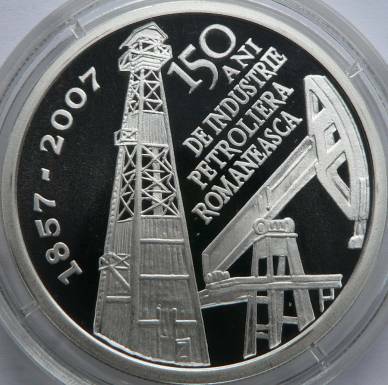 The coin marks 150 Years of Petroleum Industry in Romania. The coin pictures above are present on the site through the permission of an anonymous donor. The first oil refinery in Walachia (and the first in nowadays Romania) was built in 1857 at Rîfov near Ploieşti by Teodor Mehedinţeanu. The equipment was imported from the state-city of Hamburg. The refinery was the third installed in the entire world (the first being built between 1854 and 1856 at Jaslo in the Austrian Empire, nowadays Poland). In 1857 only 275 tons were produced, and the crude oil was for the first time taken into account as industrial production. 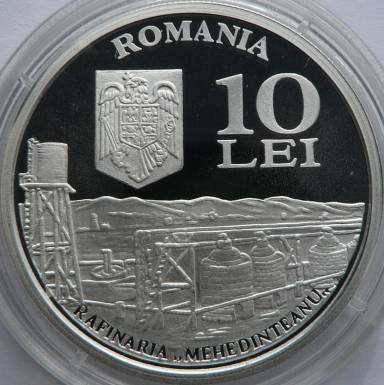 In 1861 Romania exported for the first time refined oil - a quantity of 1041 hectoliters. The Romanian word "păcură", meaning crude oil or petroleum, is derived from the Latin picula. A toponym "Păcură" is attested in a Moldavian diploma issued in 1440. "In Tazlăul Sărat, near the village of Moineşti, in Bacău county, petroleum mixed with water is gushing from a spring, and our peasants have the habit to use it for lubricating the axles of the wagons; they say that it is much better for household necessities than the resin they extract from trees, but only if it is separated from water."